(Nanowerk News) Scientists at the U.S. Department of Energy’s (DOE) Argonne National Laboratory, in collaboration with researchers from Purdue University and Rutgers University, have merged materials science and condensed matter physics in a study of a promising solid material that conducts lithium ions. The transport of ions, or charged atoms, through materials plays a crucial role in many electrical systems — from batteries to brains. Currently, the leading ion-conducting materials are liquid and organic, but the development of solid and inorganic ion conductors could have broad applications in energy conversion, bio-engineering and information processing. In this study, samarium nickelate, a material that is also a solid, was shown to quickly transport lithium ions under certain conditions. The study was published in Proceedings of the National Academy of Sciences USA ("Strongly correlated perovskite lithium ion shuttles"). The study reported that for samarium nickelate, the quantum phenomena at play within its molecular structure affect the material’s properties on a larger scale, and its unusual structural features can yield favorable electronic properties. 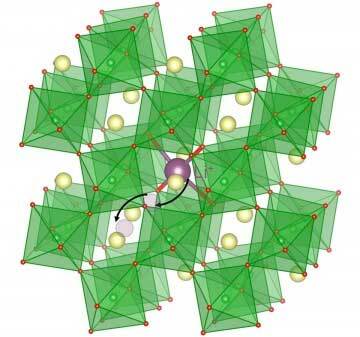 In an earlier study ("A material that gradually 'forgets'"), the scientists discovered that small ions, like protons, could move through the samarium nickelate material very quickly. “Then we asked what would happen if we inserted slightly larger ions, like lithium, into the material,” said Shriram Ramanathan, a co-author of the study and Professor of Materials Engineering at Purdue University. Lithium ions play an important role in the battery world: many batteries in use today rely on the transport of lithium ions through an electrolyte material to facilitate the flow of electrical current. Not only does the samarium nickelate quickly transport lithium, it also displays a level of electrical resistance that is desirable in electrolyte materials. On its own, samarium nickelate behaves like a metal, allowing electrons to freely pass through its crystal lattice. However, when scientists insert lithium ions into the material, the ability of free electrons to pass through is reduced by eight orders of magnitude. This resistance allows the material to avoid problems that often plague other liquid electrolytes that are commonly employed, such as unnecessary energy loss and short-circuiting. “We have identified a material that has insulating properties better than liquid electrolytes such as alkyl carbonates, which are commonly used in current batteries, and ion conductivity rare for a solid,” said Subramanian Sankaranarayanan, scientist at Argonne’s Center for Nanoscale Materials. “It’s a rather counterintuitive result that adding electrons to the system makes the nickelate more insulating,” said Rutgers University researcher Michele Kotiuga. Kotiuga performed the first calculations to determine how the material’s electronic structure changes when introduced to lithium. With these calculations in hand, the team then used capabilities offered through Argonne’s unique suite of DOE Office of Science User Facilities — the Advanced Photon Source (APS), the Argonne Leadership Computing Facility (ALCF) and the Center for Nanoscale Materials (CNM) — to obtain a more detailed description of the mechanisms causing the behavior. The team also made use of the National Synchrotron Light Source-II, a DOE Office of Science User Facility at Brookhaven National Laboratory. The APS probed the samarium nickelate using high-intensity X-rays as scientists gradually added the lithium. In real time, the scientists viewed how the electronic structure and chemical bonding evolved down to the atomic length scale. The scientists also used the ALCF and Carbon, a high-performance computing cluster at CNM, to simulate ionic motion in the lattice. Using the ALCF’s Mira supercomputer, the team modeled the dynamics of the system to predict what pathways the lithium ions could take through the nickelate. The scientists plan to study other materials that may display similar properties to identify other ions that samarium nickelate can conduct.